What to say...I gave myself some time to think about this romance, I haven't been particularly sure about my opinion in its regards. 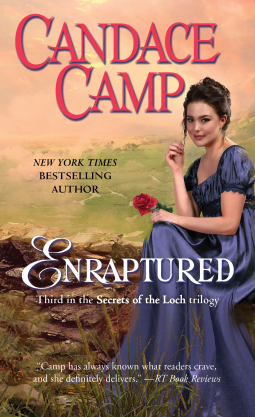 Enraptured is overall a good romance, there are extremely (no misused superlatives here) engaging and, even new, aspects, it's not predictable, with uncommon traits, it made me smile a lot and I liked the connection and interactions between the protagonists but also between all the characters. Moreover is quite sweet and fascinating, especially in its surrounding events and developments, the background in which the love story is settled is much mysterious and beguiling. However, the author has a problem, in my opinion and for my experience with some of her works, when it comes to reduce the story cutting out not particularly relevant descriptions or intermissions. Quite often they are too long and they unnecessarily overburden the storyline making the reading slow and difficult. Nevertheless I liked the novel, I loved both the protagonists, they are very well calibrated in their personalities and interactions, the hero, Coll Munro, is very sweet and caring, I enjoyed very much all his internal fights and tribulations, I liked his strength and his loyalty. He is probably the strong point of this romance but he is also undoubtedly supported by a very strong and confident heroine, Lady Violet Thornhill; her personal story is quite touching itself, all the difficulties she had and still has to demonstrate her amazing capacities as an archeologist, followed by the struggles to have people accepted her ambitions, all this make the story rich. Concluding, this is a good novel, that had the potential to be much better if less seasoned. I have to prise the prologue, very moving, and it opens the story marvellously.